You’ve heard people talk about not being matched up; that’s why they lost or didn’t score well or whatever. They are very likely telling the truth. Matching up is paramount to success in bowling. It’s the transference of energy from you to the ball to the pins – matching your rev rate and speed to each other AND to what the lane wants. First I’d like to describe what I mean and then we’ll talk about how to recognize it and produce it. 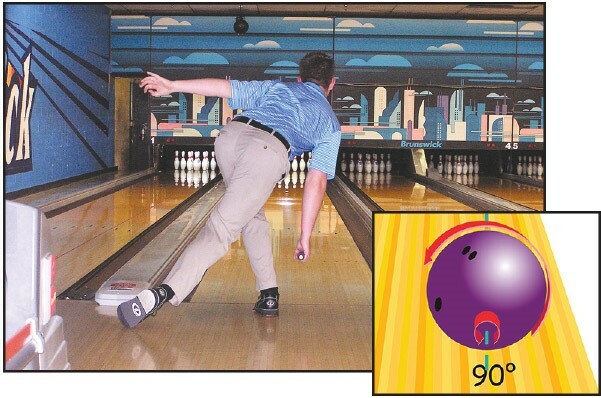 The term rev rate in bowling refers to how many times a ball revolves as it goes down the lane. That’s different than rotation. When you hear about a bowler’s rev rate on the television show, you’ll hear numbers like 420 or 550, for example. That means the bowler’s shot had 550 revolutions per minute. Well, that’s pretty silly. The ball is not on the lane a minute. It’s more like 2.0 – 2.4 seconds. It would be way more accurate to say the bowler had 14 revs or 16 revs or whatever. That is not, however, how we talk. We talk about revs in terms of minutes – revolutions per minute – even though the ball is only on the lane a fraction of that time. The other part of the marriage is speed. You’ll hear talk about ball speed being 19.5 miles per hour. The ball is not on the lane an hour. That 2.0 seconds I mentioned earlier translates to 20.45 miles per hour and 2.4 seconds is 17.05 mph. So, if the speed is 19.5 mph, the ball is only on the lane about 2.1 seconds. Just as a point of information, if you have a scoring system in your center that provides ball speed for you, know this. That speed is calculated just in front of the pins. That is not the speed off your hand. Most ball speed readings you hear about on the PBA telecasts are taken much, much earlier on the lane. The ball loses 2 – 2.5 mph between when you let it go and when the reading is taken. So if the reading says 15.5, you actually were at 17.5 or more when you let it go. In addition, please don’t take those numbers to the bank. You don’t know how or when or if the speed indicators were calibrated, so you can’t know if they are accurate. What you want to pay attention to is how consistent you are, not the actual numbers. If one shot is 16.6 and the next is 18.4 (on the same lane), be concerned. Unless you really intended to massively increase your speed on that second shot, that variation is too great to see similar ball motion. What you are looking for is consistency. The closer together your speed numbers are, the more similar your ball reaction can be and the more accurate your read. The more accurate your read, the better your adjustment. To really understand how a person’s rev rate and ball speed relate to one another, we also need to understand the ball’s rotation. You’ve heard about axis rotation and axis tilt. 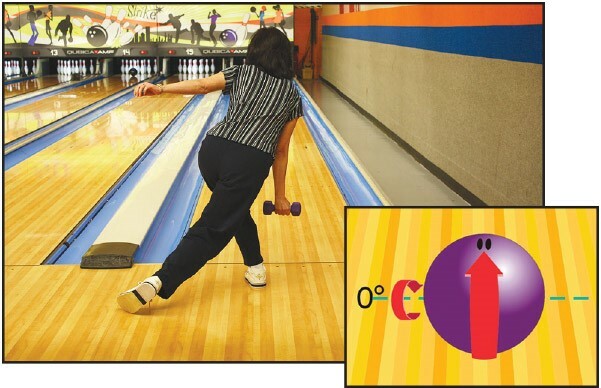 In fact, in the August 2011 edition of Bowling This Month, I talked about how to create the different axis rotations I’ll be discussing in this article. It’s not uncommon to confuse revs with rotation. Revolutions are actually the number of times the ball rolls around its axis, like a car tire on its axle, while rotation is essentially the direction of those revolutions. Think of tennis. When Novak or Serena put top spin or back spin on a shot, they angle the racket head in such a way that when it hits the ball, that angle causes the ball to travel in one direction (up in the air, across the net, deep to the baseline, whatever) while rotating in another direction. You can really tell this is happening when you see the ball hit the court and subsequently scoot sharply off in one direction or another while opponents whack it on the handle or flail at empty air. We do the same thing at the bottom of the swing – applying torque so that the ball rotates instead of just revolving. The ball is always traveling toward the pins (eventually), but it is not necessarily rotating in that same direction. If, like the rear wheels of a car, it does rotate in the same direction it’s traveling, it has what is called zero degrees of axis rotation. It is rotating in the same direction it is traveling. To produce this type of rotation, your hand would be directly behind the ball at delivery. See the graphic and the picture called Zero. You can see the ball’s direction of travel and, with the photo, where the hand would be to make that happen. Zero degrees of axis rotation or your version of it, is a great release to use when lanes are squirrelly. The ball will still make a good move when it needs to but you won’t get a lot of bad information since the ball won’t react violently. This is often called end-over-end or forward roll. It’s also a great adjustment to make when you need to tweak carry. Walter Ray, Norm Duke, and Chris Barnes all use this type of roll frequently and well. If your hand turns inward a bit at the bottom of the swing, you will impart a different rotation to the ball. 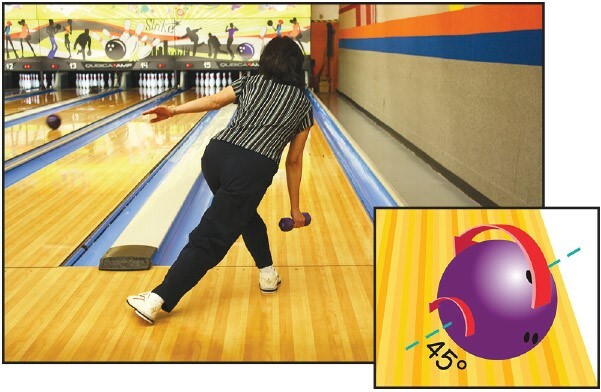 The picture and the graphic labeled “45” shows that the hand is no longer behind the ball but rather slightly around the side. The direction the ball will be traveling is not different but its rotation certainly is. The ball is now rotating 45 degrees to its direction of travel. This rotation is the most versatile you can use. It arcs and doesn’t have a lot of surprises while still finishing strongly in the pocket. Since it is the most versatile, your version of 45 will probably be the release you use most. In addition, you can dial down toward zero or up toward 90 when the lane demands more or less axis rotation. The photo and graphic labeled “90” show the hand on the side of the ball at the delivery point. Again, the direction of travel has not changed but the rotation is dramatically different. The ball is still traveling toward the pins but it is rotating at a 90 degree angle to that direction of travel. This axis rotation is the most skid your release can create. It also usually gives the most violent back end. Not for the faint-hearted, this release is speed and condition sensitive. You really need your version of it to complete your arsenal, however. Rotation is still a vital part of any rev rate/speed conversation. Let’s say that you had those 420 revs and zero degrees of axis rotation. That’s a lot of revs. Revs make the ball hook, right? Not. It’s just one of the four forces a bowler imparts to a ball – rotation, tilt, speed, and revs. It takes all that plus what the lane gives you to create “hook.” In fact, if you have a plethora of all those forces, I can fix the lane so the ball doesn’t hook. ALL the factors – you, the ball, and the lane – have to get along in order for you to see the ball motion you desire. All those revs would not have the same effect with zero degrees of axis rotation as they would have with 45 degrees of axis rotation. So, the angle your ball is rotating has a huge effect on its reaction to the lane. If the front wheels of a car are turned to the left, those tires are no longer rotating at zero degrees of axis rotation but have changed the angle of their rotation so the car can make a corner safely. Can you see how that would apply to your bowling ball “making the corner”? You will skid out or crash if you try to take a corner with too much speed or if your tires are spinning too fast for the amount of traction allowed by the road – when it is slick from rain, for example. We all slow down to make corners. Your ball has to slow down to make a “corner” as well. Current buzzwords for the matching up phenomenon are rev dominant and speed dominant. If you have more speed than your rev rate and rotation can accommodate, you will throw the ball through the breakpoint. If you have a high rev rate and/or lots of rotation but slow speed on a house shot, you’ll likely experience early hook. If you have that high rev rate and slow speed on slick lanes, you could be in great shape. If the lanes are medium or a bit dry, your high rev rate and speed won’t be what the lanes want. You’re not “matched up.” The same would be true if you have a lot of speed and a medium rev rate. You won’t be giving the lane what it wants…..unless they are a bit dry. Then that great speed and medium rev rate might be just what you need to get through the heads and mids with enough energy for serious back end work. If the lane doesn’t want what you brought, you’re in for a long night. That’s why it is so important to be versatile. If you have one speed that you cannot vary ON DEMAND and only one or two releases, you might be a pretty good house bowler (as long as you found a house that wanted what you have). A tournament player, however, will not be successful with so few weapons. Even if you only go to your local association tournament and to Nationals, you’re a tournament player. Why spend the entry fee and all those travel expenses without giving yourself a shot (pun intended) to make a little of that back? That doesn’t even mention how much more fun you could have getting lined up faster at league! You don’t want to be a rev dominant player. Neither do you want to be speed dominant. Get with a qualified coach and learn to vary both so that no matter what the lane requires, you can provide it. Image credit: Bowling ball / pins graphic (©iStock.com/istrejman) is licensed for use by BTM and is the copyrighted property of its original creator.